On Friday I spent a day with the Adventurer Dave Cornthwaite as he tried out a Freecross. Dave is attempting Expedition 1000 (25 journeys by different non-motorised means, each 1000+ miles) and was trailing the Freecross as a possible future mode of transport. The Freecross is pretty much a cross trainer on wheels. Not that hard to master although it takes a while to coordinate the pushing of the arms and stop it from steering side to side down the road. Once you have mastered going forwards you learn to steer by leaning and control is quite sharp as you have both front & back breaks as well as 8 gears so it has a good top speed! Needless to say we had a lot of fun on a rainy day in London. They aren’t going to replace the bike but definately worth giving them a try. 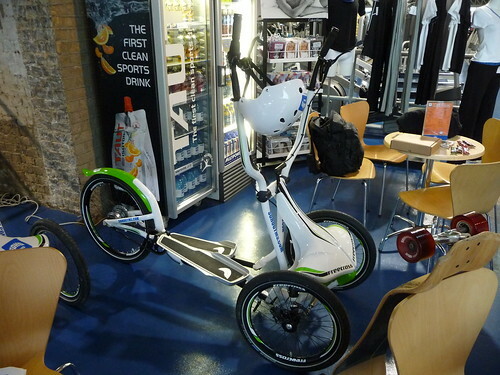 If you are interested in having a go then Soho Gyms have exclusivity in the UK, you can hire from them or even buy one! BTW, does anyone know the piece of music used in the middle of this video? Pirates of the Caribbean?